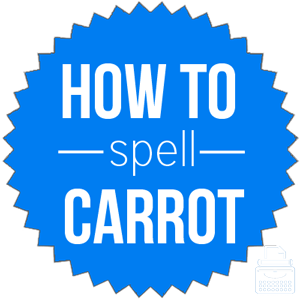 Spelling of Carrot: Carrot is spelled c-a-r-r-o-t. Definition of Carrot: A carrot is a root vegetable that is orange in color and shaped like a spindle. Carrot may also refer to a reward or bonus offered or promised in order to motivate one to work harder or strive for something. Pronunciation of Carrot: Carrot is pronounced care-et. Carrot and karat are homophones. Carrot rhymes with merit and ferret. What does carrot mean? Carrot is a noun. It is a biennial herb of the Umbelliferae family that is orange, shaped like a spindle, and classified as a root vegetable. Carrots are often used in cooking and are eaten cooked or steamed, as well as raw. While they were preparing the soup for dinner, he showed her how to properly chop carrots. They checked the garden for crops that were ready to harvest and found only one single carrot ready for picking. Carrot is also used to refer to a particular reward or advantage offered to someone, usually an employee, in order to induce or motivate one’s work or behavior. Workers who could meet their deadlines consistently were offered a carrot in the form of additional vacation time. The carrot being offered was only a small bonus payment and did not seem worth it to many of the employees. Carrot and a stick: a tactic that uses reward(s) for good or desired behavior and punishment for undesired or poor behavior. Many often say “carrot on a stick,” but this is not the correct idiom. If your methods of persuasion do not work, here is the carrot and stick policy. According to Merriam-Webster’s, carrot was first used in the year 1533. Carrot comes from Medieval French, carotte, from the Late Latin word carota, which is originally from Greek’s karoton. Since carrot is the name of a specific food, there are no synonyms. Carrot is a noun referring to the orange-colored root vegetable, or to the reward offered for desired behavior or results, usually in the workplace.